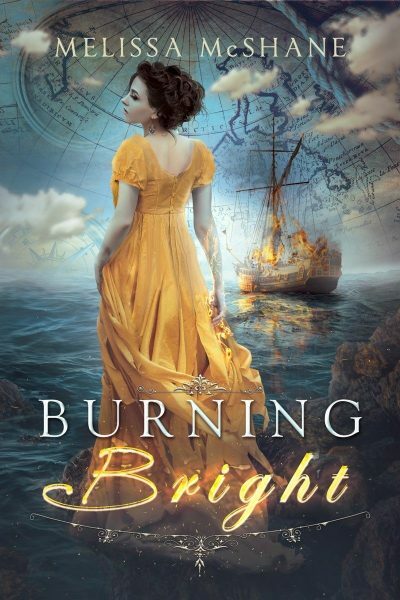 2016’s Burning Bright is the first volume of Melissa McShane’s Extraordinaries series. Elinor Pembroke discovers she has extraordinary powers when she wakes to discover her bedchamber is on fire. She extinguishes the flames with a thought. This marks her not just as a so-called scorcher, a pyrokinetic, but as the very special sort of scorcher who can control and dismiss the flames she creates. Since the year is 1812, this means that Elinor is no longer an unremarkable middle sister well on her way towards spinsterhood. She’s now a valuable commodity on the marriage mart. Her father is eager to hawk her to the first sufficiently well-born prospect. Elinor has no interest in marrying the titled man her father selects. Her father makes it clear that she has two choices: she can either agree to the loveless but practical marriage he wants for her or she can spend the rest of her life as a penniless, scorned dependent. There is no third option. At least to his way of thinking. Elinor takes a third option. She offers her services to the Royal Navy. Every manner of Talent is potentially useful to the Navy, but Elinor’s ability to protect RN ships from enemy scorchers is extraordinary. The Navy is as sexist as the rest of British society in 1812, but not so sexist that they will turn down an extraordinary Talent willing to sacrifice her good name in order to defend the nation’s interests overseas. Elinor is assigned to the Athena under Captain Ramsay. The Athena is one of several ships assigned to deal with pirates in the Caribbean. Although the golden age of piracy is a century past, piracy is still a problem for the English. thanks to pirate king Rys Evans. Evans has enrolled a majority of the surviving pirates into a brigand collective. The collective is powerful enough that Spain calculates that it is cheaper to buy off the pirates than to suppress them. England prefers not to submit to blackmail. A few encounters at sea in the company of fellow Talents are sufficient to convince Elinor of several truths. Her talent is not merely more flexible than that of other scorchers, but much more powerful. While she’s useful as defense, her power to ignite sails and sailors makes her a deadly weapon. Just as her Talent made her a potentially valuable bride, it makes her a resource that other RN captains might covet and scheme to obtain. Crawford is a nasty fellow, quite unlike Ramsay. Pirate King Evans has his own scorcher, a deranged pyrokinetic who is doubly dangerous in his madness. Crawford is the sort of captain who, having led his ship into ambush, will cheerfully use the services of a teleporting bounder to escape, leaving Elinor to die on a doomed ship. Do I need to defend the notion that there might have women in the navies of the early 19th century? They existed, even though navy regulations, not to mention social conventions, took a very, very dim view of them. I don’t know if the author is fascinated with fire or if it’s just chance that the first two books of hers I have read starred pyrokinetics. This book belongs to the Veni, Vidi, Vici Through Air Power school of alternate history, in which the author introduces into familiar history some extraordinary element, such as dragons in the Napoleonic War, or dinosaurs in the Old West, or biplanes during the late Roman Republic. This does not derail history to the extent that such an oddity would logically derail it1. It’s a bit of head-scratcher how that works — some sort of historical inertia, perhaps — but readers seem to like it. In Burning Bright. all the plot-enabling features of history-as-we-know-it seem to be more or less the same. One change I was bound to notice: Evans’ pirate cooperative seems to have has butterflied away the War of 18122. The presence of superpowered individuals has not butterflied away slavery in Burning Bright, although one imagines that a few Talented slaves would have an effect on slave uprisings. The author appears to have tried to avert her gaze from slavery in the West Indies, the novel’s scene of action, but lapses in one brief scene. I imagine that the reasoning here is that readers might be less sympathetic to Elinor and her RN chums if the book went into too much detail about just why the West Indies were so valuable to England. This is a better book than the previous McShane I tried. Tying it to a specific period means the setting is less generic than that of The Smoke-Scented Girl. The prose seems more practiced. The result isn’t quite as polished as Mary Robinette Kowal’s Glamorist books, but I expect people who liked those would enjoy this book as well. Burning Bright is available here (Amazon), here (Amazon.ca) and here (Chapters-Indigo). 1: In defence of the author of Veni, Vidi, Vici Through Air Power, Caesar won most of the battles anyway. It’s just that he wins them even more decisively with his biplanes. 2: A war in which the US tried and failed to steal Canada on a nonsensical pretext, after which the Americans lied about their intentions. Canadians, for their part, lied about the effectiveness of their laughably inept militias. Naval Historians point out that there were females on RN warships, legally and in accordance with regulations. Thus before the 1797 Battle of Cape Saint Vincent the Admiralty were short of Marines. So they borrowed an army foot regiment. Now army regulations still applied so some females were on the strength (nominally to do the laundry I think). They may even have got the battle medal, many years later. "Canadians, for their part, lied about the effectiveness of their laughably inept militias. " Nice to see a shout-out to Westlake, this definitely sounds like that genre. As are all the Temeraire books, of course.